Leading up to what would become the major amendments of 1977, the Committees of jurisdiction in the Congress began considering the possibilities for altering the financing of the Social Security system. 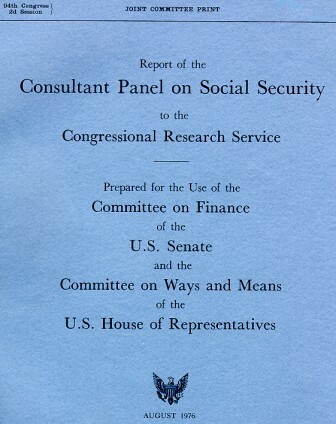 One particular study of Social Security's financing was that undertaken by a group of consultants in 1975-76, and which is reproduced here in its entirety. This study grew out of a February 1975 initiative undertaken by the Chairmen of the two Committees to explore some of the policy options that they might want to consider in any comprehensive legislation. The Chairmen turned to the Congressional Research Service, which in turn contracted with a panel of expert outside consultants headed by Dr. William Hsiao. Their charter was for "a study of the various ways in which the Social Security benefit structure might be revised and of the effects of such revision on beneficiaries and program costs." Their report, published in August 1976, explored in technical detail several potential changes to the financing of the system. Of particular interest in this study is the exploration of the idea of shifting the basis for the indexing of initial Social Security benefits from the increase in average wages during a worker's career, to the increase in average prices during that career.